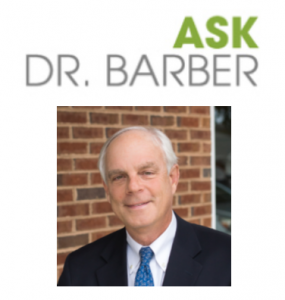 Every month Dr. Barber answers questions submitted by readers of Guilford Woman and Kernersville Living magazines. If you’re interested in reading past articles, click here. A. Coolsculpting works, but not for everyone. It is so important that you be evaluated by an experienced Coolsculpting practice. When the procedure is done on the appropriate patient, that is, one who is dealing with a localized pocket of fat, then a good result can be expected. The problem arises when the indications for Coolsculpting get extended to patients who are just not good candidates for the procedure. Who is the best candidate? The best results that we see are in patients who are close to their ideal body weight but have an isolated area of fat that just will not respond to diet or exercise. The areas that we most commonly treat are under the chin, the abdomen, the hip and love handle area, the inner thighs, and the inner knee area. Coolsculpting works by applying a freezing temperature to the treatment site for a certain number of minutes (35-45 minutes), with each different location requiring a different amount of time. After the fat freezes, a percentage of the fat cells die. The body recognizes that these fat cells are damaged and will metabolize the cells, clearing them from the body after about 3 months. Studies have shown that with each treatment, about 22% of the fat cells in the treated area will die and be removed from the body. On average, the number of treatments per area that is necessary to achieve a good result is two treatments per site. Rarely a single treatment will satisfy the patient and occasionally it will take three treatments. In our experience, about 90% of patients report good to excellent results and about 10% report disappointing results. In our patients who did not get good results, it was most often because the patient was not the best candidates for the treatment and should not have been treated. Some patients did not have an adequate number of treatments to get good results, that is, they did not agree to additional treatments in order to treat to correction. There is another very small group of patients who seem to be good candidates but experienced no results whatsoever, we call this group of patient’s non-responders. Fortunately, we have seen very few non-responders. So to answer your question, Coolsculpting does work, just be certain that the place you are having it is experienced and is being honest with you regarding expectations. Q. Can you tell me what the latest options are on non-surgical wrinkle reduction? I have fine lines around my mouth, my cheeks and under my eyes. I am only 50 and definitely do not want to have a face lift. I have tried pretty much every cream in the department stores and on the infomercials and my wrinkles are still in the mirror. Please tell me there are some good options. Q. I am totally confused about what kind of skin care would be good for my face. I am a middle-aged woman who has some sun damage from my younger days, but otherwise fairly decent skin quality. My goal is to minimize wrinkle formation and help fade some of the brown spots on my cheeks. Nothing that I have purchased from the cosmetics counter has helped very much and I have spent a small fortune. Is there a skin care program that you recommend for most women?